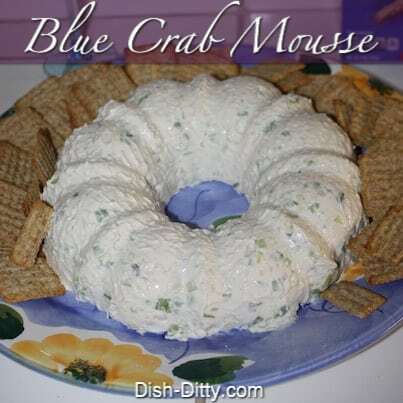 A creamy blue crab spread for crackers, this recipe I believe came from the back of a can of Campbell’s soup in the 50’s or 60’s. My mom made this regularly for parties and gatherings and it is so good that there is always a crowd around it. I’ve placed the original recipe below my adjusted recipe. 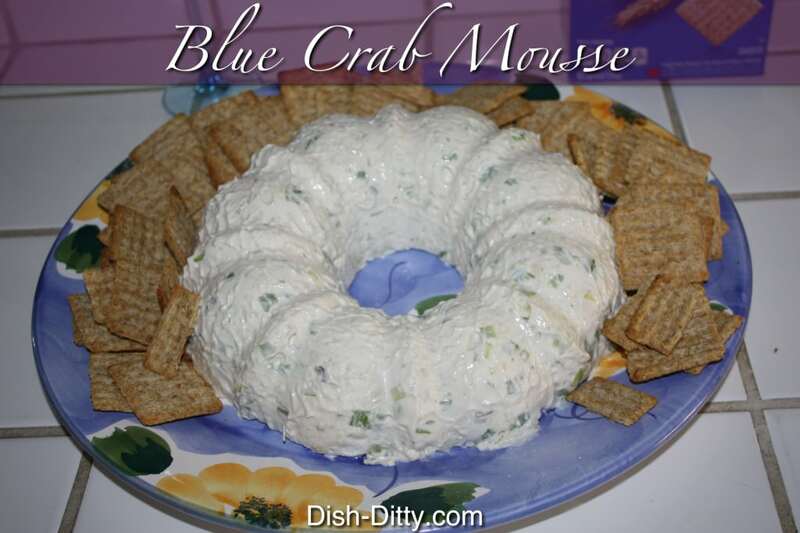 The adjusted recipe is really just a larger portion and uses a full 1 pound of blue crab meat and is designed to fit in a bundt cake pan mold. I recently served this at my friend Kim’s son Trevor’s Graduation party and it was a huge hit. I always reserve about 1 cup of the filling for myself to have the next day since I just can’t get enough. My mom frequently made this for parties and it was one of our favorites. My mom would make this big batch and then we would keep a small bowl set aside in the refrigerator so we could have it for lunch on sandwich bread. Yeah, it's the best. Slightly adapted from my mom's original Crab Mousse Recipe, designed for a standard bundt pan mold. Dissolve gelatin in cold water and set aside. Heat mushroom soup (undiluted) until bubbly. Add gelatin and cook for one minute. Add cream cheese to soup mixture and whisk or beat until cream cheese is fully dissolved. Remove from heat and add mayonnaise, celery, and green onions. Fold in crab, making sure to keep it chunky. Pour into lightly oiled bundt pan and chill overnight. To remove, put bundt pan in shallow pan of hot water for 1-2 minutes to loosen the dip from the pan. Then turn bundt pan over onto a serving platter. Serve with your favorite crackers. I like it with Triscuits, but my mom always preferred Rye Crisp crackers. When my mom made this recipe for parties, she always doubled it. We would keep a small bowl set aside in the refrigerator so we could have it for lunch on sandwich bread. Yeah, it's the best. This recipe is one my mom always served, not sure the origin but I'm guessing the back of a can of Campbell's soup or from a friend. Dissolve gelatin in cold water. Heat soup (undiluted). Add gelatin. Beat cream cheese, add mayonnaise, celery, scallions and crab. Combine and pour into lightly oiled mold and chill overnight. Best served with rye crisp crackers or Rye crackers. 1 Reply to "Blue Crab Mousse Recipe"
My grandmother makes this recipe every Christmas. It was very popular in the 50’s. I love it and has been a favorite part of our family gatherings.